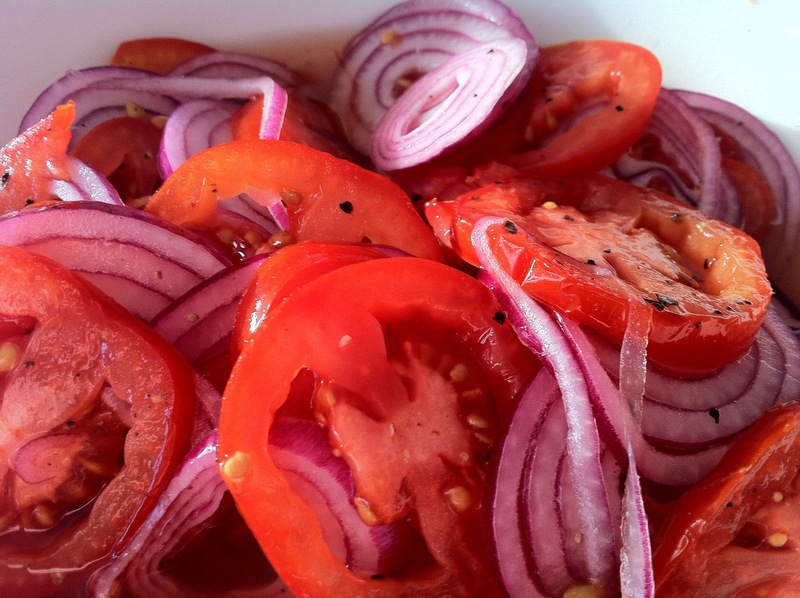 One of my earliest summer meal memories is my grandmother’s tomato and onion salad. The other main memory refers to my brother falling asleep face first into a plate of pickled beetroot. I’m pretty sure the tomato-onion salad featured at that table too! So back to the salad in question. This is how I prepared it yesterday. Sliced tomato, sliced onion. One layer of tomato, lightly seasoned with salt and pepper. Cover with a layer of onion and the next layer of tomato. Repeat seasoning and layering operation, ensuring the last layer is tomato. Season! Mix white wine vinegar and sugar to taste. (Hint: just enough sugar to help take the edge off the vinegar, it should be a little bit tart, yet not so tart that your lips curl up and your eyeballs cross!) At this stage you can either serve immediately or let it develop some flavour. Last night I took the latter option and layered everything in a storage container for an hour or so. Every time I walked past I flipped it over and back again. Tomato & Onion Salad: Ready!!! Now for the big question! How is it that The Engineer and I share this same memory? The same salad? The same “only in summer” salad? Two continents, seven or nine time zones depending on the time of year, 15750 + kilometres and we were both enjoying a dish so simple, we felt sure was unique to our part of the world. It just goes to show our worlds have far more in common than we ever imagined. Oh, I’d forgotton this one. Now I want to make it myself, summer or not. Good choice for the summer, but I love the factoid about sharing the common salad memory with The Engineer. Ha! My mother made that same recipe, but with cucumbers instead of tomatoes. Ooh, cucumbers and onion would be a great mix! 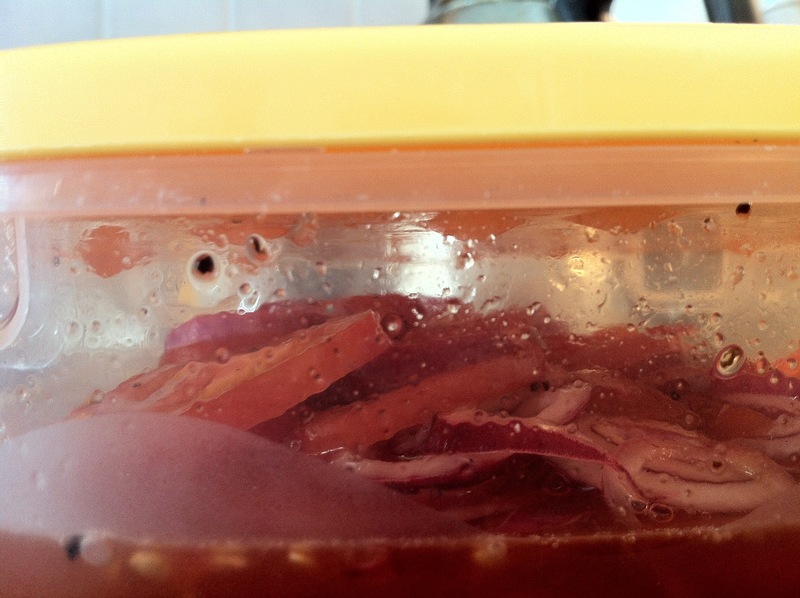 I have a really good quick pickling recipe too – involving a potato peeler. Maybe it’s time to share that one as well! What a yummy-looking salad! thanks for the idea. I am going to try this. I hope you and yours are well and enjoying a lovely summer. Much love from across the pond! Now that we are back in normal Maine summer weather, it’s lovely here. Summers are getting hotter, though. Finnish friends and fans! Don't forget to #springforward into #summertime 🙄 Just imagine by October 2020, this will be a thing of the past! You can expect all sorts of posts here. I post about the regular life of an irregular Finn. Alternatively I post about the irregular life of a regular Tasmanian. Long posts, short posts, photos and recipes. I'll even share my favourite music on occasion. My glass is always half full although I definitely do not subscribe to the notion that the grass is greener on the other side. As they say "expect the unexpected".